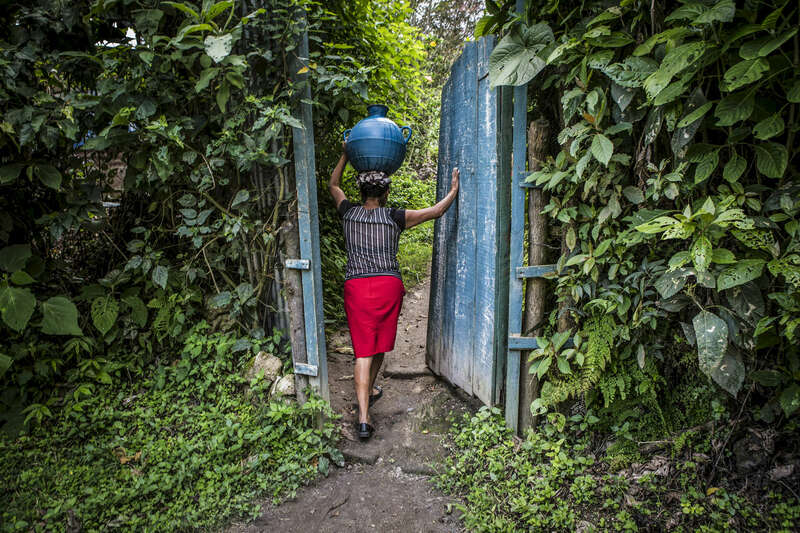 Nejapa, El Salvador- Zoila Ramirez, 40, carries a jug of water to her home in San Jeronimo Los Planes, Nejapa, El Salvador on Friday, June 22, 2018. Water is collected during the rainy season in the communal tank and sold for 10 cents a jug during the dry season, money raised is used to fund water trucks once the tank runs dry (usually the tank only lasts for two months into the dry season). Unfortunately the roof was lost during a recent hurricane and very little water has been collected since, worrying the Perez family. Nejapa is not only home to a number of bottling plants including Coca Cola and Lactolac, it also lies above one of El Salvador's largest aquifers, feeding neighboring communities and much of San Salvador. The San Antonio River, once a main source of water for Nejapa, has been contaminated by the waste produced by industrial bottling plants since their arrival in 1996. Bio filtration systems were installed but have been broken since 2006.